Thank you for visiting "Green Gables Girl" blog about simple joys of life. Here you can find poems, thoughts and quotes on daily things, true love, faith and virtues. I am fond of books very much and if there is something interesting, I share it with my readers. Sometimes I write my own poems or reviews of favourite songs, books and movies. I like to draw or paint and I will share my pictures in the posts. I am interested in "green living", web-development, classic and vintage things, paintings, crafts and art of photography. "Green Gables Girl" blog is named in the honour of my favourite heroine from the book "Anne of Green Gables". I like the book series a lot, the same as the red-haired Anne. This book is very motivational and teaches how to find simple joys of life. It tells that dreams will come true when we believe in them. And if things are not going as we wish, so maybe there is something more beautiful in awaiting, worthy for taking an adventure. 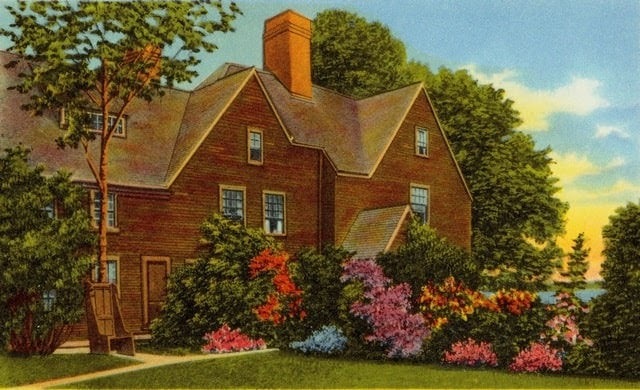 * Postcard "Garden view of House of the Seven Gables" by Tichnor Brothers Inc., Boston, Mass; circa 1930–1945. ۞ Вітання із "Зелених Дахів"